Vogel cut points were first discovered by Marcel Vogel (1917-1991) and must be cut to a precise angel in order to be called a true Vogel. These points are best used for healing and meditation as they are cut to maximize the collection, amplification and transmission of the Universal Life Force. Each stone is cut in a way to amplify, coalesce and focus thoughts/energy that you wish to direct into your body/mind or that of another person. 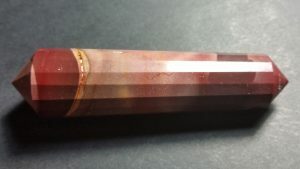 The design of a Vogel of these natural stone points allow for your thoughts and energy, to enter the stone at the receptive end, be amplified and focused as it travels in a circular pattern through the stone and be transmitted like a laser beam from the focal end, In simple words a Vogel during healing and meditation helps in accomplishing our goals and dreams with a laser like focus and projection. Marcel Vogel was a research scientist with IBM for many years and holds a number of patents in the field of luminescence. 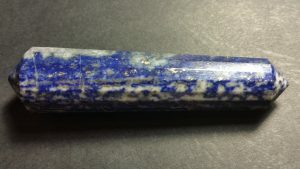 He spent the later years of his life exploring the powers of quartz crystals among other interests, which is when he can upon the design for a ‘Vogel’ crystal. 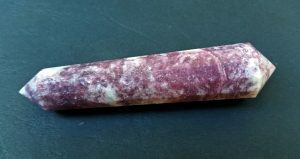 What makes a crystal a “Vogel”? 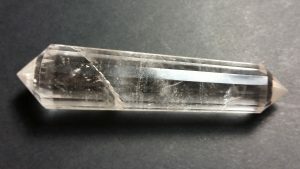 For a crystal to be considered a ‘Vogel’ it must be made of natural quartz and be cut under the guidelines of Marcel Vogel – these include intent and precision in workmanship in ordered to assure that the Universal Life force is attracted, amplified and them transmitted through the crystal properly. The crystal must be made of natural quartz. The crystal must be hand cut with the necessary intent, skill, and understanding of the crystal and its intended future uses. The crystal must be doubly terminated or cut and polished to this shape. The crystal has to be cut completely aligned with the C axis of the quartz crystal. The receptive (sometimes called female) end of the crystal must be faceted forming an internal angle of 51 degrees, 51 minutes, 51 seconds. This is the same angle as the angle of the sides of the Great Pyramid at Giza. The crystal must have four or more side facets. The transmitter (sometimes referred to as the male) end of the crystal must be faceted with a more acute internal angle than the receptive end.